How to sell your vintage Jewelry? If you wish to sell your jewelry to EDJ and require an estimate, please supply us with as much information on your jewelry as you can. Our jewelry experts will go through all of the information you provide and will contact you to present our offer. We will consider rings, earrings, bracelets, brooches, and necklaces. Although our main focus is on vintage and antique engagement rings, we will also make offers on modern and contemporary pieces. You are welcome to call us at 212 265 3868 to discuss selling your vintage jewelry, or you can fill out the online form below. – A picture of the jewelry. Try to photograph each piece in bright lighting. For the best natural light, take a picture close to a sunlit window. Additionally, placing the jewelry on a blank piece of paper will help give your picture more clarity. – If you have a GIA certification for the diamond or a certification of appraisal from another company, please attach it. If you know the carat, cut, and clarity, but don’t have an appraisal, you can type it in the form below. – If you know the history and age of your jewelry, please provide these details as well. – Please provide us with your contact information. Once you receive our best offer and are ready to send your jewelry, please only send the piece(s) with registered and insured mail. Enclose contact information including your name, phone number, email address, and mailing address. Call or email us to notify our associates that the package is en route. We will promptly contact you when your jewelry arrives. While in our possession, your jewelry is fully insured by our insurance. 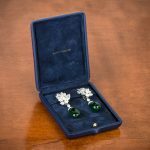 Why Sell to Estate Diamond Jewelry? Selling an engagement ring or other personal jewelry pieces can be an emotional and overwhelming undertaking. Very few jewelers have the experience, expertise, or the financial resources to pay fair-market prices for fine antique and estate jewelry. Choosing a reputable jewelry expert to help you navigate the appraisal and buying process is crucial when you choose to sell vintage jewelry. 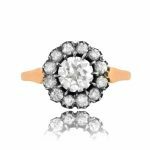 Estate Diamond Jewelry has been in the business for over 30 years, and in addition to interpreting the value of gemstones and precious metals, our experts deeply understand the worth and rarity of vintage and antique pieces. Our gemologists at Estate Diamond Jewelry are experts in rare antique jewelry and will be able to factor in the added value for older pieces. This is something that few other companies or pawn shops are able to do. – If we choose not to buy your jewelry, we will still provide you with an approximate value of your piece. – We will pay a premium if we discover that your jewelry was made by Cartier, Tiffany, Van Cleef & Arpels, or another famous jewelry designer. – We expect to see some signs of wear on antique and estate jewelry. – Alterations from the original can result in devaluation.